When you register, we require you to complete a registration form and a medical questionnaire. This is because it can take a considerable time for us to receive your medical records. The form may be printed off from the website. Please click on the link below. Please fill this out and bring it in with you on your first visit to the practice. We will ask you to also complete other new patient registration forms when you come to the practice, which include sharing information consent, online registration forms. Please be prepared to complete other forms when you attend. New patient registration forms can be printed off from this website. Complete and sign these and bring them into the surgery to register with the surgery. We will require sight of your ID, so please also bring photographic and address ID for the surgery to copy for your medical records. It is the practice policy that if patients that are registered at the practice move from living within the practice area to outside the practice area they will be de-registered from our practice list on the grounds that the patient has moved out of our area. It is the patients responsibility to re-register at a new GP surgery in the area where they are now living in order to receive continuing care. Your GP practice holds copies of your patient health record electronically and in paper format. Both contain the healthcare information about you that your GP needs including your medical history, medications, allergies, immunisations and vaccinations. If you have previously registered with a different GP in England, upon registering at this practice your electronic health record will, where possible, be transferred automatically from your previous GP practice through the use of an NHS system called GP2GP. Please click on the link below for full information and a leaflet should you wish to print this off. To prevent fraud, we will require sight of proof of identification, please bring this to the surgery with your registration forms. Please provide both photographic ID and proof of your address. We will accept registration if you do not have this immediately. You will however, be asked to produce this when you next visit the surgery. Click on the links below for a copy of the Practice Booklet and a New Patient Registration Form - please note other forms will be required to be completed when you visit the surgery, which include sharing information consent and online registration. Please be prepared to complete other forms when you visit the surgery. Please see below. 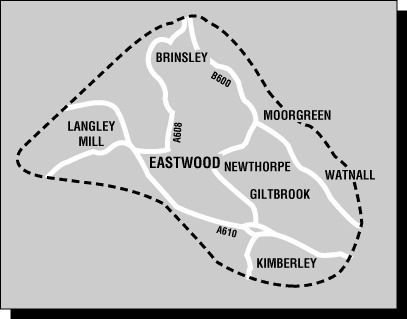 This is the catchment area for Eastwood Primary Care Centre and is the local area that the surgery and attached community services are able to cover. If the area that you live is not mentioned in the map below, unfortunately, we can not accept your new patient registration or your change of address and you will need to register with a different GP surgery that does cover the area where you are living. Please tell the receptionist when you arrive for your next appointment, or call us on 01773 304700 between 11:00 and 18:00.